Originally published by Chelsea Haines in Guernica Magazine, this interview with Jon Rubin surveys the recent controversy about the Palestinian iteration of the Conflict Kitchen, and addresses some of the ongoing tensions of presenting art projects about politically sensitive subjects in the US. Chelsea Haines (CH): What are the criteria for U.S. “conflict” in selecting countries for Conflict Kitchen, and how did you arrive at the idea for Palestine in particular? Jon Rubin (JR): We’ve always defined conflict fairly broadly from ideological conflict to troops on the ground. For quite some time we’ve talked about a focus on Palestine. Certainly no one can deny that Israel is conflict with Palestine and no one can deny that the U.S. is the largest supporter of Israel internationally—not only financially, but also in the United Nations where the United States is one of the very few countries that does not recognize Palestine as a state. 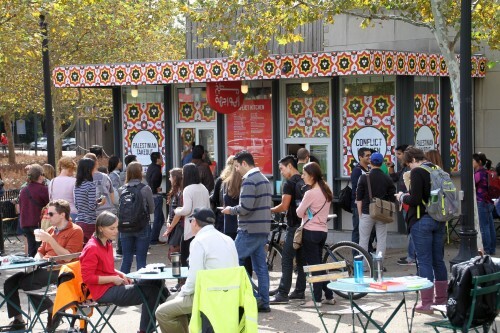 The criticisms that are often presented to us by some in the conservative Jewish community about our Palestinian version are: first, that the U.S. is not in conflict with “Palestine” (quotes are theirs) and second, that Conflict Kitchen should counter the Palestinian viewpoints it presents with pro-Israeli viewpoints, otherwise we are spreading dangerous propaganda. The contradiction here is fairly obvious; if we are not in conflict with Palestine than why are they so afraid of us presenting Palestinian voices? Of course the answer is obvious, and we see it throughout the U.S. and the world, controlling the master narrative of Israel means vigilantly controlling the narrative about Palestine. CH: Tell me about your research this summer in the West Bank. JR: I traveled with our chef Robert Sayre and one of our assistant chefs John Shaver throughout the West Bank in June of this year. When we travel for research our strategy is to simply move from kitchen to kitchen. It’s truly a wonderful way to travel—food shopping, cooking and eating in one home for lunch and then another for dinner. The process of cooking takes us immediately into the rituals and rhythms of daily life and also places us firmly in the position of learners. We were meet with incredible generosity by all of the families we ate with. The trip was also eye-opening, as it is for anyone who travels into the West Bank, because nearly every aspect of daily life is effected by the occupation—from check points and travel restrictions to growing settlements and economic roadblocks. Our guide throughout was a brilliant man named Mohammad Barakat who lives in East Jerusalem. We’ve continued to work with him virtually via our performance project at Conflict Kitchen called the Foreigner. Each week Mohammad is available to have lunch with our customers through the body of a local Pittsburgher who functions as his real time physical avatar. It’s one of the ways we try to collapse and confuse the space between what is familiar and foreign in the project. CH: You also always work with the local diasporic community from each country you select. What were your experiences like with the Pittsburgh Palestinian population? How did they respond to the project? JR: One of the great things about the project is that it becomes a beacon for the local community that we’re focusing on. I met a lot of local Palestinians in Pittsburgh leading up to the opening. It is a small population of about 300 people. Often they are afraid to self-identify as Palestinians because they fear people will see them in a negative light or even because some Pittsburghers don’t know there is such a place as Palestine. A lot of Palestinians here simply say they’re from the Middle East. On Nov 18th we celebrated the re-opening of the project (after the death threat) with a simple Palestinian potluck at the East Liberty Presbyterian Church. Around 200 people came and brought a homemade Palestinian dish. I met people at that event who had never been to the restaurant and typically don’t publicly identify as Palestinians, but told me if anyone from the media wanted to talk with a Pittsburgh Palestinian, I could give them their names. Another thing that happens is that the communities we’ve worked with here locally overlap and support each other through the years of the project. We’ve had many Iranians, Afghans and Venezuelans show up for our Palestinian events. CH: It also seems a crucial part of the project is to connect with people in Pittsburgh who may previously have had little knowledge of Palestinian culture. JR: When we opened the Palestinian version we had a very long line, and people were really engaged and curious about the food and the perspectives of Palestinians. Our customers are a pretty diverse group and are incredibly friendly and open. After five years of running this project, we’ve definitely become part of the larger fabric of the city. As an artist who lives here and wants a more sophisticated engagement between local social dynamics and global discourse, it’s great to see that reflected via the relationships we’ve developed with our customers. For some people it’s a political act to eat from us three days a week because they recognize they are financially supporting the premise of the project each time they come. 95% of our annual revenue is purely from the public via food sales. After it became known we received a death threat, people came out to support us and our Palestinian community in a lot of ways. While we were closed people posted statements of support all over our façade, and there were a few rallies where folks came out to express their support for the project and more specifically for the value of Palestinian voices in our community. The crisis afforded a moment for a constituent body to vocalize itself and add more breadth to the conversation around Palestine than was occurring up until that point. CH: Let’s talk about the events that led to this project becoming so controversial so quickly. JR: For years we have hosted biweekly lunch hours where expats and experts are invited to be part of an informal discussion with the public around food. For the last two years these discussion-based events have been co-sponsored by the University of Pittsburgh Honors College. We decided to co-host an event a week before the opening of the Palestine version with a young Palestinian doctor, Nael Althweib, and a professor from the University of Pittsburgh, Ken Boas, who is Jewish and works on Palestinian human rights issues. After the program was announced, a representative from the Jewish Federation of Pittsburgh went to the Honors College dean asking him if he knew that he was going to be co-sponsoring an anti-semitic hate speech event. They said that if Conflict Kitchen did not add the Jewish Federation to the event or if the university did not pull their sponsorship they would go to the board of trustees and tell their Jewish members to pull their support for the university. Eventually, after many conversations between the dean and I, in which I stressed the claims were baseless and that pulling sponsorship from an event where a professor from his own university was speaking was a serious breach of academic freedom, the dean agreed to move forward. But, I could tell this was a fight he wanted no part of. What I later found out is that after the event the Jewish Federation went to the provost and chancellor of the university and made the same threats. All of this just to silence free speech about and by Palestinians. The university administration felt caught between a rock and a hard place, and they made the decision to end their relationship with us moving forward. About 60 people ended up coming to the lunch hour including the dean, members of the Jewish Federation, and we actually had an incredibly civil conversation. Subsequently however, the Jewish Federation along with a few pro-Israel students made claims that the event was rampant with anti-semitism and they felt unsafe. Some said they were not invited or allowed to attend—which was obviously not true. We had received a grant from the Heinz Endowments (of which Theresa Heinz is the Chairman) last year and in response to all of these articles B’nai B’rith went to the Endowment and publically asked them to disavow the grant. At this point things started moving from the fringes of media and political discourse into to the center. CH: Did the Heinz Endowments contact you before they made their statement? JR: No, they never contacted us. It was a great opportunity for the Heinz Endowments to take a stand and support freedom of expression, but they chose not to. I think they went into a panicked crisis mode. They gave a statement of disavowal to B’nai B’rith saying: “[the Endowments] want to be especially clear that [Conflict Kitchen’s] current program on Palestine was not funded by the endowments and we would not fund such a program, precisely because it appears to be terribly at odds with the mission of promoting understanding.” The statement went on to say, “[the Endowments] emphatically does not agree with or support either the anti-Israel sentiments quoted on Conflict Kitchen’s food wrappers or the program’s refusal to incorporate Israeli or Jewish voices in its material.” Besides the fact that the Heinz fundamentally ignored the premise of our project, this framing of the viewpoints of Palestinians as automatically anti-Israeli is such a gross over-simplification. Such statements negate the complexity of Palestinian history and culture and perpetuate the most dehumanizing reading of their lives and the silencing of their voices. The president of the Endowments contacted me the next day, a little late, and when I met with him I pointed out that the actual language of the grant funding was for “future programming,” of which the Palestinian version is a part. So their denial is convenient if not factually inaccurate. Furthermore, their argument that Conflict Kitchen is “at odds with the mission of promoting understanding” is outlandish. What it implies is that if you present the viewpoints of North Koreans, Cubans, Afghans or Venezuelans you might be promoting understanding, but if you focus on Palestine you’re doing the opposite. What does this statement says to our local Palestinian community? Sorry, you hold no power in this city, thus your culture and opinions have no inherent value. Their other claim, that we refuse to publish Israeli viewpoints or include Jewish voices, is just false. Many of the interviews we did during our research trip were with Israeli Arabs and the first event we organized included a Jewish voice—not to mention the obvious fact that I am also Jewish. Of course, these are not the Israeli or Jewish voices some people are interested in hearing. CH: Was there anything specific that these critics pointed to that could validate their claims? JR: Some of the interview statements on the food wrappers are critical of Israeli policy, certainly, but that is also to be expected. The majority of people who come to the restaurant have had no problems with the sentiments publicized on the wrappers. CH: What I read on the wrappers was a wide range of different responses to the Israeli occupation from the serious to the mundane to even the humorous. This is not anti-Israel propaganda; this is one Palestinian’s stark and sobering assessment of the byproduct of systemic oppression on the people of Gaza. And frankly, this is not a story that a lot of people want to hear. But one of the things we feel the restaurant has done fairly well is use food as a way of bypassing people’s defenses in order to pull them into narratives that are sometimes foreign and not always comfortable. It’s also important to note that this interview is presented in the context of many others, not only about resistance, but also about food, marriage, governance and more. CH: What are your plans for Conflict Kitchen now that you have received the Carole Brown Creative Achievement Award? How do you plan to move the conversation forward with the project as a whole, as well as with the Heinz Endowments, which partially funded the award? JR: Well, it’s pretty ironic to get an artist achievement award from the same foundation that disavowed one of my artistic achievements (that they had also earlier funded). It’s a goddamn brainteaser. The Endowment had reinforced the worst bullying tactics of powerful lobbying groups and had created a less-secure environment for their own funded project to do its work in. Now, I have no problem with outside organizations and individuals critiquing or challenging the methods of our project, that’s part of the nature of making work in the public sphere. But I do take issue when individuals and organizations seek to police and silence speech. The counter to the call for less speech should always be more speech. I have decided to put the unrestricted $15k from the award entirely into the current Palestinian version of Conflict Kitchen. The byproduct of this is twofold: First, the money allows me to bring more Palestinian voices into our city and add greater depth to an iteration of the project that I very strongly believe in; and second, this will provide a great opportunity to the funders of this award to stand up against the criticism that will certainly come again their way because of the use of these funds. During my awards speech, I also put forth a proposal that the Heinz Endowments, and all our local foundations and funders, add a freedom of expression clause to their bylaws and contracts. I mean, it seems like a no-brainer, but they actually do not have this in any of their language. Frankly, in order for us to have a healthier arts eco-system funders need to insulate their relationships with artists from the influence of moneyed interests, lobbying groups, and politics. The funders shouldn’t have to parse their words, or say one thing to one group and another to another. One statement, freedom of expression, end of story. Now, we’ll see if anyone takes me up on that offer. Hopefully, my use of the award funds will put them under pressure to do so. The other conversation that needs to happen, on a local and national level, is how can we talk about Palestine and Palestinian perspectives in the American cultural sphere. Obviously, its difficult work, but that’s all the more reason why its important territory to negotiate. The Mattress Factory Museum in Pittsburgh recently had to cancel an exhibition with Palestinian and Israeli artists, for different reasons, and we’re going to have a public conversation together to unpack some of the challenges. CH: Especially following the war this summer, I think we’re at a tipping point where artists and intellectuals will have to start thinking more seriously about Israeli policy and speaking up more in public ways. Anthony Bourdain recently won the MPAC Media Award for an episode of his CNN food travel show, Parts Unknown, and in his award speech he lamented that his entertainment show provided one of the most nuanced representations of Palestinian culture in American media today. JR: Yeah, we actually had Laila el-Haddad, co-author of The Gaza Kitchen Cookbook, who toured Bourdain through Gaza on that show, come to Pittsburgh and work with us on a few events. She’s a brilliant speaker, and she came with her parents, who are doctors in Gaza and passionate speakers in the own right. Ironically, the World Affairs Council, a nonpartisan organization that has worked with us for years co-sponsoring events, decided to pull their support from Laila’s visit because their board chair happens to also be on the board of the Jewish Community Center, and she was concerned how this would read to that community. Fortunately, we have our own revenue stream, and in times like this financial autonomy is perhaps our greatest asset. Listen, I agree it is a tragedy that a 40-minute entertainment show is the greatest entry point to Palestinian culture most Americans have had. On the other hand, I’m incredibly conscious of how disassociated many academic discourses and artistic productions are from the general public. I think our own project could be much more rigorous as well, but one of the things I like is how we occupy a place on the street, seven days a week, a daily reminder that a conversation about Palestinian culture needs to be part of our city’s culture. Jon Rubin is an interdisciplinary artist who creates interventions into public life that re-imagine individual, group and institutional behavior. He is an associate professor in the School of Art at Carnegie Mellon University and head of the Contextual Practice area. Chelsea Haines is a Pittsburgh-born, New York-based curator and writer. She is a contributing editor of Guernica.